Adding 100% Pure Honey to your emergency food supply is a fantastic choice because of the virtually unlimited shelf life and health benefits that this natural wonder brings. Legacy Food's honey, whether liquid or creamed, is the finest raw honey available. No pesticides, all organic bee-keeping means no chemicals, artificial sweeteners or syrups. Un-heated and unfiltered for the richest, healthiest, and most delicious 100% Pure Raw Honey. Most people have never had the opportunity to try fresh, 100% pure honey fresh from the hive. They don't understand the rich, complex flavors that are ripe with natural enzymes and pollens. But all that is about to change when you add 100% Pure Honey from Legacy Food Storage to your emergency supplies. 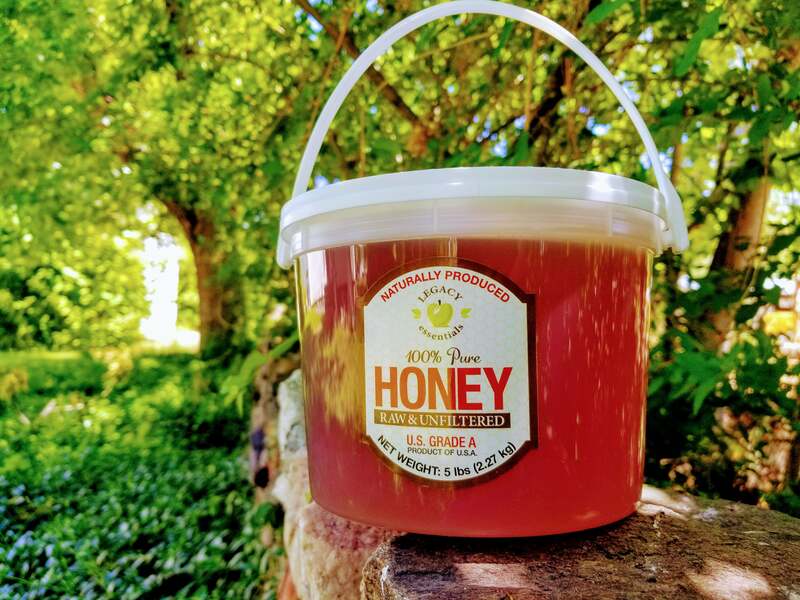 Because this honey is so delicious, you will be hard pressed to make it last and will probably need to order an extra 5 lb container just for daily use! Our 100% Pure Honey comes in both the liquid and creamed variety and is unfiltered, un-heated and comes from the healthiest, organically raised bees. Our local beekeepers use no chemicals or artificial sweeteners which ensure the highest quality honey in the world. Our honey retains all natural enzymes and pollens because it is never heated or filtered. Demand more from your honey! Legacy Food's 100% Pure Honey is gathered from a mixture of clover and alfalfa flowers and might possibly be the best tasting honey on the planet. Our liquid honey comes directly from the hive while our creamed honey is smooth, creamy, and absolutely delicious. You will be amazed by the taste and thrilled with the almost eternal shelf life! Add 100% Pure Honey to your emergency supplies today to take your preparations to a sweet, delicious new level!